Andrew Fitzsimons is a respected judge in the Dublin Criminal Courts system. He and his reclusive wife have been forced to kill a young woman and her body is now buried in their back garden. While Lydia seems to be in control of the situation, Andrew’s life begins to fall apart, especially when he suspects that their seventeen-year-old son, Laurence, knows what they have done. As the families of both the murderers and their victim fall apart, Laurence becomes obsessed with the identity of the dead girl. When a chance meeting brings the two families into contact with each other, it can’t be long until disaster strikes, especially not if Lydia has her way. 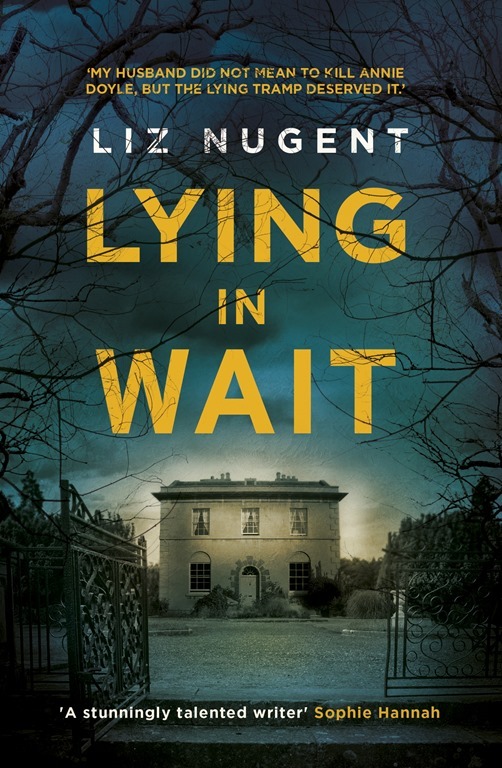 Liz Nugent’s second novel, Lying in Wait, opens with the murder of young Annie Doyle and spends the next three hundred pages slowly reeling the reader into a twisted and cleverly-structured thriller that has surprises at every turn. Alternating between the first-person views of Lydia (the wife of the murderer), Laurence (their son) and Karen (the sister of Annie), it first of all describes the havoc wreaked on the two families involved, before morphing into something very different, a dark and disturbing examination of obsession and madness and an answer, once and for all, to the question of whether blood is thicker than water. We witness the crime through the eyes of Lydia, and it is here in this early moment of unguardedness that we see the truth of the matter: how Annie Doyle died, and how her body was disposed. It doesn’t take us long to realise that Lydia is a dangerous woman: manipulative and more than a little unhinged, it is clear that she has engineered the circumstances that led to Annie Doyle’s death. Her husband starts to fall apart almost immediately, not helped by Lydia’s demands that, should they be caught, he takes the full blame, for the best interests of their teenage son. Lydia has a dark past, one that might explain her disconnection from reality, and one that is slowly revealed, along with the reasons for Annie Doyle’s demise as the story progresses. Laurence catches on quick that something is wrong, and immediately jumps to the obvious conclusion. His hatred of his father is fuelled by his father’s insensitivity about Laurence’s weight, and by his mother’s seeming innocence in the whole affair. This is the first real glimpse we catch of Lydia’s ability to manipulate and control the situation, but it still cannot prepare us for what is yet to come. Karen, meanwhile, a similar age to Laurence, gives us some insight into the family of the victim. With no body, there is no evidence that her sister is dead, though her disappearance has a profound effect on her family, tearing her parents apart and leaving Karen herself with an undeserved reputation when it is revealed that Annie was a heroin addict and prostitute. The lead detective on the case, O’Toole, is more interested in getting into Karen’s knickers than in finding what happened to her sister, and it is only five years later that she learns that the police did have a suspect but didn’t pursue the matter because he was a person of some power, and O’Toole was unwilling to rattle any cages. The three threads of the story interweave and ultimately meet as the years pass, and no further word of Annie is heard. Laurence, twenty-three and still under the full control of his mother, becomes a hero with whom we can identify. Despite the terrible things he agrees to do in order to protect his family, we still feel that he deserves a good life, something that he is unlikely to achieve living in the shadow of Lydia. A chance encounter and a big heart find Laurence attempting to make amends for the actions of his father, little more than a token gesture, but as much as he can do until his friendship with Annie’s father leads to an introduction to his surviving daughter. 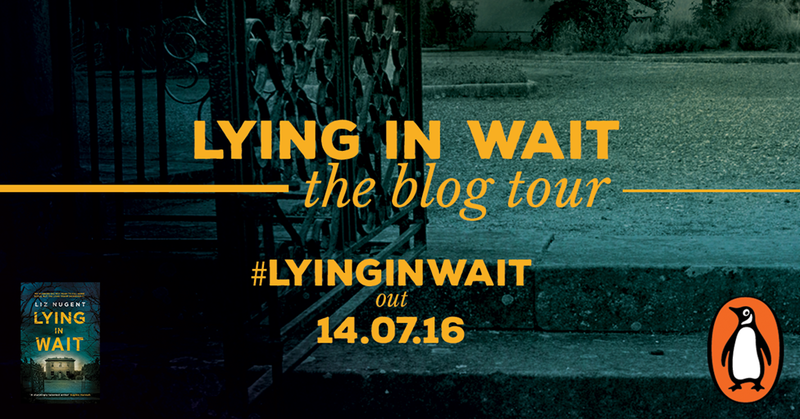 Lying in Wait is so well constructed that we never question the often outlandish turns of events, instead revelling in the twists and turns and ever-darkening tone of the story. This is, more than anything, Lydia’s story, and we watch, often in horror, as she manipulates her husband, her son and anyone else who comes into close proximity to protect herself, her home, and her family name. A masterful creation, her complex history has produced a woman who is quite clearly insane and who, once she sets her sights on something, will stop at nothing to get what she wants. Liz Nugent’s writing is beautiful, the voices of the three narrators perfectly pitched, the quirks and tics we might expect in their speech beautifully translated to the written form. From the opening page, Nugent holds the reader in the palm of her hands, so the gut-punch she delivers as the novel draws to a close feels like a physical thing, leaving the reader stunned and disbelieving, emotionally drained yet already hoping for more more MORE! I missed Nugent’s debut, Unravelling Oliver, when it came out in 2014, but it’s definitely on my must-read list even as I try to recover from the effects of this one. An incredible novel, Lying in Wait is a lightning-fast read that should be an essential item for anyone packing for holiday. It cements Liz Nugent’s place as one of Ireland’s finest living novelists, and places her, at the very least, on this reader’s “must-read” list.